1.Prepare Rainbow Pepper Relish: In medium bowl, combine all ingredients. Refrigerate until ready to serve. 2.Prepare Steaks: Coat grill rack with oil. Prepare outdoor grill for direct grilling over medium-high heat. In small bowl, combine garlic powder, paprika, oregano, coriander, salt and pepper. Rub seasoning mixture onto all sides of steaks. 3.Place steaks on hot grill rack and cook 10 to 12 minutes or until internal temperature reaches 140° for medium-rare, turning once. Remove steaks from grill and let stand 5 minutes. Internal temperature will rise 5° upon standing. 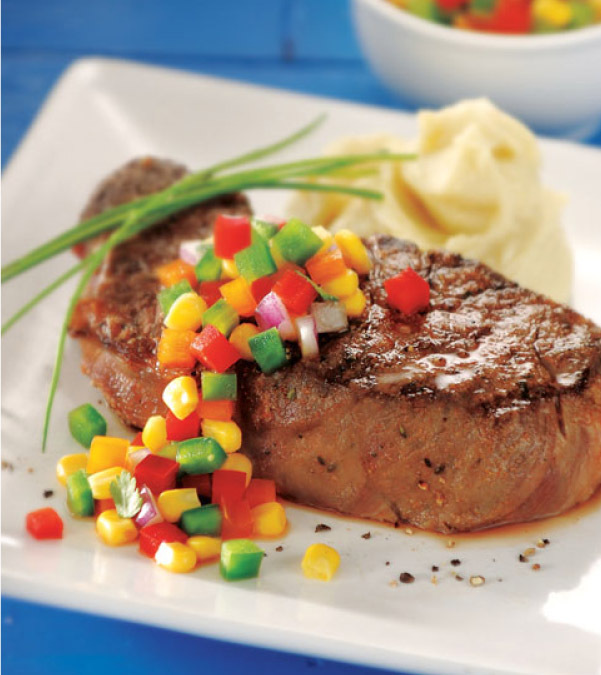 Serve steaks topped with pepper relish garnished with chives, if desired.